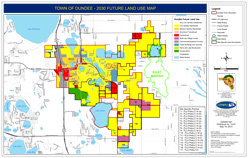 The Town of Dundee Planning Department assists in guiding all current and future planning and zoning to manage growth and development in the Town of Dundee in a manner that conforms to adopted policies and ordinances. 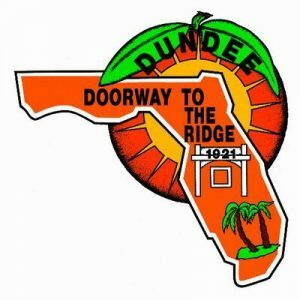 The Planning Department is responsible for administering the policies, programs, and regulations that manage the development of the Dundee community. The Planning Department performs current and long range planning, reviews site and development plans, provides technical support to Town officials, including the Planning and Zoning Board, the Board of Adjustments, and the Town Commission. The Department provides services that include public information, assistance to customers, and development review. 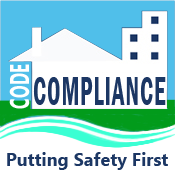 The Department is also responsible for the development, maintenance, and operations of the Town’s Comprehensive Plan and Land Development Code. The Planning Department works closely with other Town departments and Town Officials to facilitate appropriate land development that respects the character of Dundee’s neighborhoods, provides for a healthy economic base, and enhances the quality of life in the community. The aim of this website is to provide members of the public with an easily accessible source of information for planning-related matters in Dundee. For all your planning and development questions please contact our Town Planner, Marisa Barmby at 863-534-7130 ext. 110. or email at mbarmby@cfrpc.org. 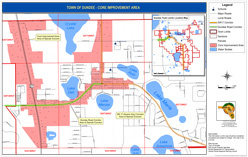 The Town receives Planning Advisory Services through the Central Florida Regional Planning Council. Please submit a signed and notarized copy of your completed application, along with the required fee as listed on the current fee schedule to Town Hall. In addition to the fee schedule set forth above, the applicant shall also be responsible for the payment of any and all extraordinary expenses, which may be incurred by the Town of Dundee in analyzing or reviewing all or any part of an application. These expenses may include the Town’s retention of a third party consultant. All of the expenses referred to in this Section shall be billed at the actual cost of fees and expenses incurred for rendering such services. These expenses will be billed separately from and in addition to the development review deposits set forth herein. The applicant will be advised of the necessity of such expenses prior to such expenses being incurred. The owner/developer and the Development Director, with the advice and consent of the Town Manager, shall jointly approve in writing an estimated cost amount before these charges can be authorized. The cost for any such expenses shall be paid in advance to the Town in the form of cash or certified check prior to incurring such expenses. Upon request of the owner/developer, the Town Council may review such expenses as to the necessity and amount. Development Review Deposits required herein shall be held in escrow by the Town and identified by account number as to the development review for which the deposit is made. The deposit shall be used to pay costs that exceed the base fee collected for the application and review. The owner/developer will receive periodic notification and statements when draws are made against the deposit account. Should the balance in the deposit account decrease to less than seventy percent (70%) of the deposit, the owner/developer will be notified to make an additional deposit to restore the balance to the full amount of the original deposit. Said additional deposits shall be made within five (5) business days of notification. Once the development review is complete, the balance remaining, if any, in the deposit account will be refunded to the owner/developer without interest.